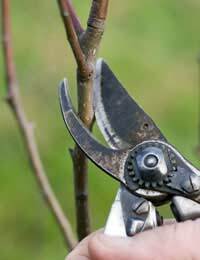 Pruning is an essential part of the maintenance of your fruit tree or bush. It encourages the plants to focus their energies on producing fruit and means you can train them to grow in horizontal lines, or a fan shape, along a trellis. Pruning is most important in the first five years of your tree’s life. This helps you build a framework that it can grow around and help it get used to growing in a certain way. During this period you should not let your plant bear too much fruit – this will sap energy from it and cause its growth to become weak. Remove fruits if necessary. This method of pruning produces a tree the shape of a goblet. It is open in the centre and its stem, or trunk, is free from branches. When buying a new apple or pear tree, you will normally be sold either a one or two year old tree. Many of these trees will have already been pruned to some extent, making your job easier. Choose a tree with a good balance of branches that already fits the ideal ‘goblet’ shape. One year old trees will generally either be sold with side shoots (feathered) or without (un-feathered). Unfeathered trees should be pruned in winter to a bud that’s just 75cm above the ground, making sure there are several good buds beneath. With feathered trees, side shoots can be taken and used to form the main branches. Remove the centre by cutting it down to a strong shoot, roughly 75cm from the ground, making sure there are two or three other shoots below it to form the main branch system. Then shorten these branches by half to form an outward-facing bud. Remove the remaining lower branches. The following winter select the best three or four branches, ideally evenly spaced and with wide angles to the main stem. Prune these stems by half to an outward facing bud and discard the unwanted branches flush right up to the main stem. During the summer, a number of lateral branches will be produced from the main branches. In the third winter select about four laterals on each main branch. Shorten them by up to half. Then cut all branches that aren’t selected as secondary branches back to just four or five buds. From this point the tree should bear fruit and pruning should become much lighter. Remove any excess growth from the centre of the tree as fruit grown in this area will be of a poor quality. The pruning process described applies to all fruit trees. However the timings of these prunings vary. Some should be done in winter, while other trees take longer to recover from being pruned and are susceptible to being infected with disease. These trees should be done in the spring or summer, and on a dry day. Those with small gardens will benefit from being able to train their fruit trees against a trellis or wall. Each tree grows to have a main trunk with short side branches on which the fruit forms.Before planting attach wire in lines across the wall, approximately 30cm apart and raised 60cm from the ground. Plant the trees roughly 15cm away from the wall and tie them to long canes attached to the wires. After planting, reduce any side branches to just four buds. In the first summer remove any new fruits so the tree’s energy is focussed on growing. Then during the winter snip any side shoots down to have just three buds. If there aren’t many side shoots then cut the main trunk down by half, to encourage more to form. Espaliers are also ideal for walls and fences. Plant them about 15cm away from the wall or fence and fix to a horizontal support wire attached to a strong support (such as the wall or fence). Cut the tree down to a bud roughly 5cm above the support wire. In early summer select the main branch and train two shoots on opposite sides of the main stem to their horizontal positions. Any other shoots that develop should be cut back to about three leaves in June or removed altogether. In the second winter select another two branches to fix to another horizontal support wire. This tier should be up to 45cm above the lower tier. Prune the vertical stem down to a bud 5cm above it. Repeat the process with another tier the following year. These pruning methods should ensure you have healthy fruit trees that grow beautifully and produce plenty of delicious fruit. I just need some basic advice on growing and pruning a cherry tree and a hazelnut tree please.